Can Ambrosia Apples be Frozen? Every summer we reach a point when the locally grown crop of Ambrosia apples starts to run out. Ambrosia apples are stored in special warehouses to keep them fresh well into the spring but eventually the supply runs out. 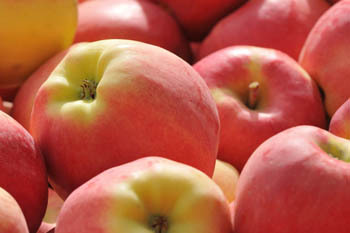 Several grocery stores import Ambrosia apples from Chile and New Zealand (they harvested them in late March) but they may not be as easy to find as we’re used to. So, how do you ensure that you’ve always got your favourite apple on hand? There are a couple of ways to preserve Ambrosia apples. You can dehydrate them, make them into sauce and can it, turn them into fruit leather, or just preserve them. These are pretty well known methods but did you know you can also freeze them? Some people soak their apples in salt water before freezing but it’s not necessary with Ambrosia apples. The salt water soak is primarily to slow the browning process but Ambrosia apples are naturally slow to brown so there’s no need. Besides, the salt alters the flavour a bit and we don’t want anything interfering with the delicious taste of Ambrosias. Make sure you freeze only fresh apples. If they are already turning, they won’t freeze well. Cut them into slices or cubes depending on how you think you’ll use them. Put them in sealable plastic bags and place them in the freezer. Be sure to use appropriate sized bags based on how you plan to use your apples. If you have the option of vacu-sealing the bag, we recommend it as it will better preserve the freshness of the apple and decrease the formation of ice in the bag. There are several things you can do with frozen apples and one thing you shouldn’t do. Frozen apples make a great pie filling. Simply take out the right amount from the freezer and cook them on the stovetop as you would fresh. You can also use frozen apples in cakes, crumbles, and muffins, just like you would with fresh. If you plan to use them for baking, cut them into the desired shape and size so that you’re not trying to cut frozen apple chunks. Frozen Ambrosia apple juice is one of the most refreshing ways to beat the heat of the summer. Simply pop one frozen apple in a blender with a cup of cold water (add a dash of lemon juice if you want it tangy) and puree. Pour it into a glass and enjoy – just watch out for brain-freeze! Another option is to combine it with some other frozen fruit and a bit of yogurt or nut milk to make a healthy fruit smoothie. Frozen Ambrosia apples are easily converted into applesauce or apple butter. While we love raw apple sauce, you’ll find the best results by cooking the frozen apples instead. We simmer them with a pinch of cinnamon and a lemon squeeze (if you’ve got a real sweet tooth you can add a drop or two of maple syrup) for about 20 minutes. Puree them and return the sauce to the pot for another 10 minutes to render it down a bit. You can have homemade apple sauce in 30 minutes using frozen Ambrosia apples. One thing we don’t recommend you do with frozen Ambrosia apples is thaw them and eat them. Unfortunately, the freezing process takes away the satisfying crunch you love about Ambrosia apples and trying to recapture that post-freezer is bound to leave you disappointed. There is one caveat to this – babies! If you’ve got a baby that is teething, they will love gnashing on a frozen Ambrosia apple slice – just make sure it’s big enough that they won’t choke on it. With all of these great ways to enjoy Ambrosia apples straight from the freezer, it’s time to rush out to the store and grab yourself a few bags so that you don’t spend the summer longing for your favourite apple.